I asked a family friend for the yummy recipe of her fried chicken. I like it a lot because even when cold it still was very tasty. Like most seasoned cooks all her measurements are approximate plus from what she told me I have to put a large amount of chicken stock powder/cube in it. Now, I do use chicken stock cubes but I try to reduce as much as possible any pre-prepared ingredients in cooking to reduce the 'E' numbered things in it and make the dishes as natural as possible. Somehow learning that I have to put a lot of it made it less appetising. Until I remembered this fried chicken recipe from my favourite Huang Su-Huei's Chinese Cooking for Beginners. I haven't cooked this for quite sometime due to general aversion to things deep fried. But it's nice to have this once in awhile. It's as tasty as my friend's with the added bonus that it doesn't have any need for chicken powder. The word 'Chinese' is added in the name to make it more descriptive and to distinguish it from any others I would have here later. Apologies to Chinese chefs out there 'coz I'm not sure if this is authentic though I did find this in a Chinese cookbook. Do try this simple and easy recipe. Mix the cooking wine, salt, sugar, soy sauce, green onions, and ginger in a bowl. Add in the chicken, mix well and marinate for at least 1 hour. Before frying, you may remove the ginger and green onions if preferred. Add the egg yolks and mix. Add the cornstarch, mix well. 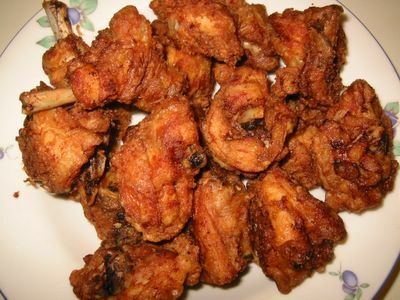 Deep fry in oil (medium heat) for about 6-7 minutes (depending on the size of the chicken pieces) or until cooked and the outside is crispy. Serve. When you say egg yolks do you mean separating the egg whites and just using the yolk?